Volume One contains four novellas that are set in Austin, Texas, in the 1880’s and are based on different books by Jane Austen. The ingenious thing about these stories is that several of the characters make appearances in all of them and many of the settings and the school, the Jeannette C. Austen Academy for Young Ladies are central to the theme of Austen in Austin. This makes for a very interesting foundation as the heroines and heroes know each other and interact on occasion. I loved that about the book. For this reason, I recommend reading the novellas in order, although they may be read as stand-alone stories. Besides the obvious difference of time and locale, the novellas have differences from canon in that the names are altered and some of the families, siblings and circumstances vary. I did not find this to be problematic but a plus in that it seemed to fit with the western setting and era. The personalities of the characters were true to their original counterparts and the core narratives still focused on the corresponding books by Miss Austen. The first story, If I Loved You Less by Gina Welborn, is based on Emma. February 1, 1882, the heroine, Miss Emmeline Travis, is busy making plans for the St. Valentine’s Ball. Her attempts at matchmaking do not go unnoticed by Noah Whitley, the president of a Savings & Loan, and close friend to Emmeline and her father Henry, the owner of Hotel Brunswick where the Travis’s make their home. Observing Noah as he attempts to curb Emmeline’s predisposition to meddle and as he experiences frustration and unrealized jealousy over her attention to Garrison Churchill was amusing. As the two of them discover their true feelings, it is as charming as their earlier bickering and banter. Romantic Refinement by Anita Mae Draper, (Sense & Sensibility), begins in September 1882. Marion McDermott is going to spend a month at her Aunt Mattie’s ranch in the Texas Hill Country. Upon arrival she is caught, quite literally, by the flirtatious and handsome ranch hand, Mr. Jeffrey Whelp, with whom she had danced three times at the St. Valentine’s Ball in February. The foreman, Brandon Tabor, a former Texas Ranger and friend to Noah Whitley seemed none too pleased at this ‘entrance’ by Miss McDermott or was it something more that bothered this striking man? The novella based on Pride and Prejudice, One Word From You by Susanne Dietze, is the third in the Volume. In October 1883 Eliza Branch with her mother and father, is attending a dance, hosted by the parents of her dear friend, Jeanie Hale. In Eliza’s haste to get to her friend, she collides with the tall, handsome and wealthy William Delacourt, owner of the Tennessee-North-Texas rail line. The ensuing encounter does not go well. The snub is made, but, unknown to Eliza, for much different and more understandable reasons. Her prejudice, sinking to a new low, reveals not only the truth behind the real man but her own shortcomings as well. Let the sparks begin! Bring in Charlie Bingham, Jeanie Hale, Jake Wicks, and Liddie and there are sparks aplenty, but all in a much different way. 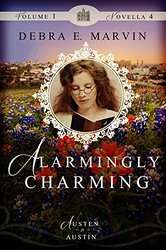 Alarmingly Charming by Debra E. Marvin is the last novella of Volume One. In 1887, Kathryn Morton is accompanying her Cousin Jane to Austen Abbey, as it is called by the girls of the school. Traveling by train and reading a novel about train robbers has Miss Morton in typical ‘Catherine Morland’ form. Add to that a haunted graveyard, night visitations, a little mystery and the stage is set for an entertaining gothic story. I loved seeing Kathryn come into her own and blossom as a young woman of confidence. Mrs. Collins, the very British headmistress of ‘Austen Abbey, and her two nephews, Harmon Gray and Jonathan Wellington, are perfectly cast in this Northanger Abbey based novella. Charming! The style of the novellas is so similar and the continuity so flawless that I might have thought they were scripted by one author had I not known otherwise. This obviously took excellent coordination and communication between authors. They all weave an inspirational thread through their stories giving the main characters a strong faith in God and a deep conviction of right and wrong. At the beginning of each novella and before Chapter One, the authors put a Jane Austen quote from their chosen book and a fitting Biblical quote. The main difference noted was two of the authors had quotes from Jane Austen’s book of choice at the beginning of each chapter and two did not. The references to Jane Austen and the mention of her books were nice additions and always brought a smile. It was neat to ‘see’ her characters in a western setting yet acting in much the same manner. These were delightful tales and I loved seeing the interaction of the characters from all four books. Since the names were different, it was fun to guess which of Jane’s heroines/heroes/villains were being introduced or alluded to. Once I had read all four novellas, I continued to think about the characters, their interactions and how cleverly they were penned to affect their own story. There are references to some characters in Persuasion so I can hardly wait for the release of Austen in Austin, Volume Two. I initially read this volume in preparation for the interview of author, Debra E. Marvin. Now I plan to go back and read it again, this time to look for interactions/connections that I may have missed and to savor the ones I did not. The novellas in Volume One were skillfully written and a joy to read. They were a change of pace and cleverly executed. I recommend them to anyone who loves Jane Austen and all her works. You will not be disappointed. Well done, ladies. I am combining the giveaway for my interview of Debra E. Marvin with this review. Your comments at both will double your chances of winning one of the giveaway books. If you have not visited the interview post, I hope you will take a few minutes to do so. 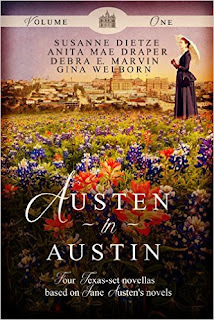 I think you will love getting to know Debra E. Marvin and learning more about Austen in Austin, Volume One, its authors and its creation. To recap the giveaway, it consists of either a paperback or eBook of the anthology, Austen in Austin, Volume One. Paperback is US only and eBook is international. If you are in the US, let me know if you prefer the eBook instead of the paperback. There is also a giveaway for the eBook of Ms. Marvin's novella, Alarmingly Charming. The giveaway will end at 11:59 P.M. on the 29th of February. As usual please leave your contact info in your comment. Good luck to all. A very nicely written review, and of course it's rewarding to hear you enjoyed and recognized the efforts we took to bring the stories together! Being an Austen super fan and a resident of Texas, your good opinion is a bonus! Thank you, Debra. I"m glad that you liked the review. The more I read, the more I realized the efforts that were involved in synchronizing these novellas. You earned my good opinion! :) I loved them all! I love the combination of Texas and Austen! Thanks for commenting, Denise! It is a great combination. I hope you get to read it soon. Thanks Denise! We love that combination too! Thanks so much for the kind review! We all appreciate the time it takes reviewers to read and process, so thank you for your efforts. I'm glad you liked the stories, too. We had a blast putting this together. Thank you, Susanne. It shows that you all had a good time writing...and I'm so glad you did. We readers are the winners. I loved the stories! Oh wow! I didn't realize how inter-connected the novellas are. That makes me more eager to give it a go. Thanks for the detailed review, Janet. They are very connected. I am eager to read it again and see what I might have missed. It was great fun finding the connections plus reading good novellas. Thank you for visiting, Sophia, and I hope you can read it soon. Sophia, the eight stories overall go right up to 1900 or so, and the next four coming out in the fall pick up with the same setting and 'cameo' appearances and four more Austen Heroines! I like the ideas. It is similar to the Holiday books by several writers who have modernized the story lines and introduced new elements. I would like to know about those holiday books as I am unfamiliar with them. Email me if you have the time. I hope you get to read these novellas and see how these ideas worked. They are cleverly done! Thank you Patty! Novella anthologies are very popular now...thankfully, but we came up with this idea about four or five years ago. It takes time to find a home for it and we were considering publishing this independently when we found a home with WhiteFire publishing. We are very thankful because they do such a nice job. You can imagine who excited we were about the stories when we saw the lovely covers. The next one is up for pre-sale (I believe) and is similar but not the same. Now I'm even more curious to get to this book! I hope you enjoy the novellas as much as I did. Thanks for visiting, Maria. Thanks Maria! Music to my ears! I'd heard of this novella anthology in various places around online, so it's lovely to find out more about it. Although I hail from the UK, I really enjoy variations relocated to the US as well, no matter the time period. Thanks for letting us know more about it Janet. Heading over to the interview post right now! I hope the ebook works for you, Anji (and thanks for checking in on both of Janet's posts. I've also very happy to know you heard about our book (See me waving with delight!) There are SO many wonderful choices out there, so I'm happy you found it. Hi Anji, and you are welcome. These stories are pretty unique in how they are done. Hope you enjoy the interview! I thought the answers were awesome! I'm glad you visited and commented, Eva. Hope you get to read this soon. Thanks also for telling me your preference. Janet T, thank you for reading Austen in Austin, and then sharing your thoughts so eloquently. That takes time and effort and we not only recognize it, but appreciate it. This is the encouragement that drives us to keep writing when we could be doing so many other things. Thank you. Well done review. With a daughter and her offspring living in Austin, I look forward to experiencing the stories.